Ethel Dickinson was born in St. John's and educated at Methodist College. After taking a domestic science course in Guelph, Ontario, Ethel Dickinson returned to St. John's to operate the interdenominational Domestic Science School on Harvey Road. The school followed no religious creed, and neither did it confine itself to serving any particular class of students. Children from the poorer homes attended the school along with classmates from the homes of the rich. Courtesy of Archives and Special Collections (Collection MF-329), Queen Elizabeth II Library, Memorial University of Newfoundland, St. John's, NL. 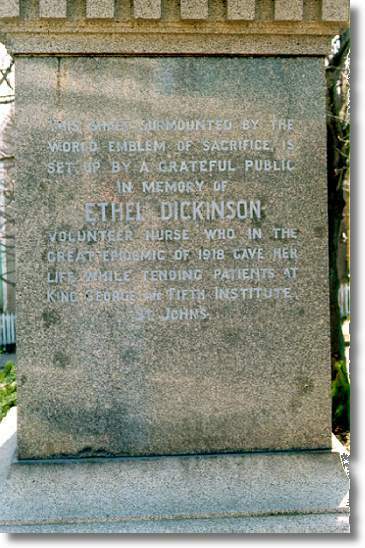 In 1915, while visiting England, Ethel began working as a volunteer nurse to wounded Newfoundland soldiers. Three years later she returned to the school, but in 1918 an outbreak of the Spanish flu forced the school to close. Ethel began caring for the sick at the emergency hospital established at King George V Institute on Water Street. Already in poor health, she contracted the Spanish flu and died that same year. This monument on Cavendish Square in St. John's was raised by public subscription two years after her death. Click on photo or "larger version" for inscription found on the base of the monument.